When you’ve finished with high school or university there’s still plenty of learning to be done. That’s why we love the rise of sites like Udemy 5 of the Top-Rated Productivity Courses on Udemy 5 of the Top-Rated Productivity Courses on Udemy Get procrastination under control. These five courses from Udemy will help you get your work done in less time and steer you in the right direction. Read More and massive range of courses they offer at reasonable prices. Today, we’re going to take a look at five courses that will teach you about programming in Python How To Generate Dummy Data in Ruby, Perl and Python How To Generate Dummy Data in Ruby, Perl and Python You’re building a web application, and you need some realistic information to shove into it. You need to check that your validation functions work perfectly, and see that your product actually works. Read More , one of the hottest languages out there right now. 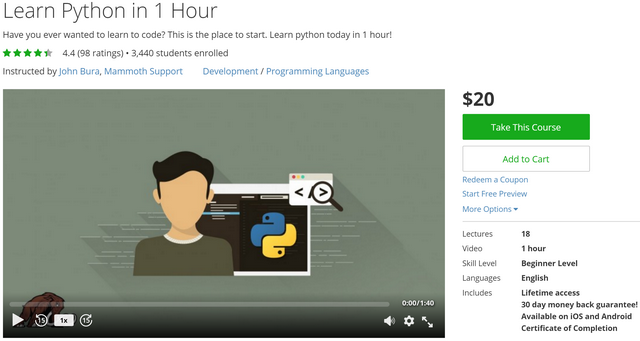 Whether you’re a beginner or you know Python pretty well, we’ve found a course for you. And they’re all highly rated, so the others who’ve signed up for them are quite happy with their purchase. 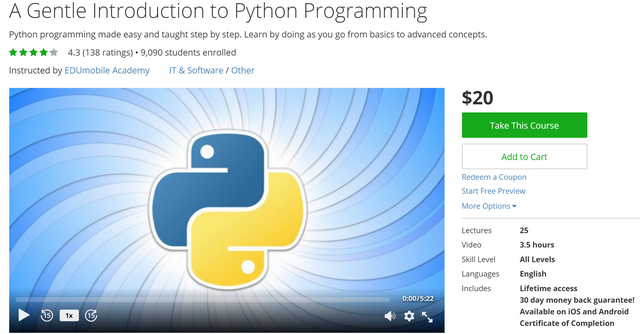 This course is perfect for the Python beginner for two primary reasons: it’s cheap, coming in with a cost of only $20, and it doesn’t require a large time commitment, taking only 1 hour to complete. If you’re just dipping your toe into the language (or programming in general), this will let you get in and try it out. This is a class that aims to teach with a hands-on approach. Essentially, that means that you’ll actually be writing apps that you can add to your portfolio later on. 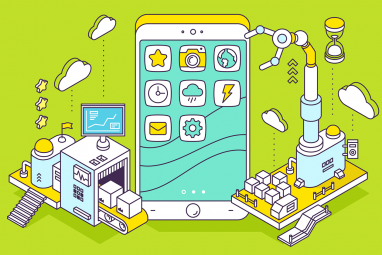 When you complete the course, you’ll have a basic knowledge of Python programming, dealing with lists, IF statements, and working with variables. The last three will be useful as you work in other programming languages, so even if you don’t end up sticking with Python, or you want to learn it along with other programming languages This Quiz Finds the Right Programming Language for You This Quiz Finds the Right Programming Language for You If you want to start coding and can't decide where to start, take a minute to find out what language best suits your interests. Read More , the foundation you gain here will come in handy. If you have a decent amount of programming experience, it’s probably best to skip this one, as the other courses we’ll look at today will probably work better for your level of knowledge. For beginners, though, this should prove to be a solid starting point. This is another course that’s aimed at beginners, but it takes a slightly different approach in that it’s not really here to teach people who want to look for a career as a Python coder. Instead, it’s designed for people who are happy in their current field, but would like to learn a bit of Python to automate some of the more tedious aspects Clever Automations to Hack Your Morning and Wake Up Easy Clever Automations to Hack Your Morning and Wake Up Easy What if I told you that you could have a better morning with the help of some handy tech? With these tips you can wake up more refreshed and ready to take on the world. Read More of their workflow. Basically, the lectures here will teach you to write basic programs that will perform practical tasks. It doesn’t go into advanced techniques, so you won’t be learning sorting algorithms or anything like that (the later courses will teach you that stuff, so don’t think you’re off the hook). Knowing how to do this will help you save some time in the long run, and not only that, but you’ll have a useful new skill to add to your resume Is Your Resume Flawless? Not If It Includes These 17 Things Is Your Resume Flawless? Not If It Includes These 17 Things All too often, tips focus on the thing you should have on your resume, but how often do you see good advice on the things to leave off? Read More , regardless of the field you are in. For those of you looking to break into a career as Python programmer, the other introductory courses will probably suit your needs better, though the content offered here will still be useful. At $50, though, you might be better off buying two of the other courses for the same price, as you’ll get more towards your goals. For everyone else, though, the $50 spent on this could save you a lot of time, which will make you more money in the long run. 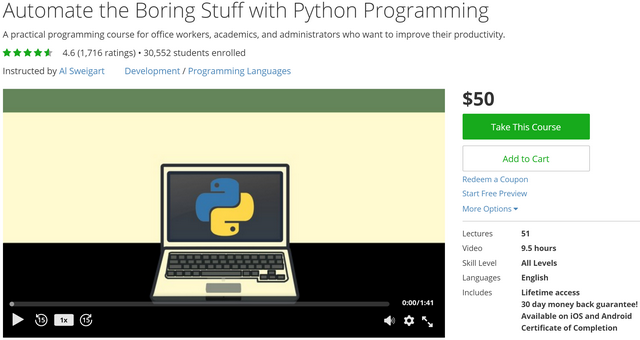 Here we have a course that’s meant for someone looking to get serious about learning Python. 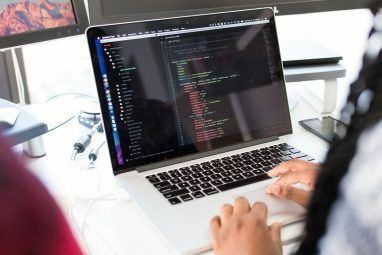 It requires you to at least have a basic knowledge of programming and how to use the command line and a text editor, so while the requirements to get started aren’t huge, you will need some background. 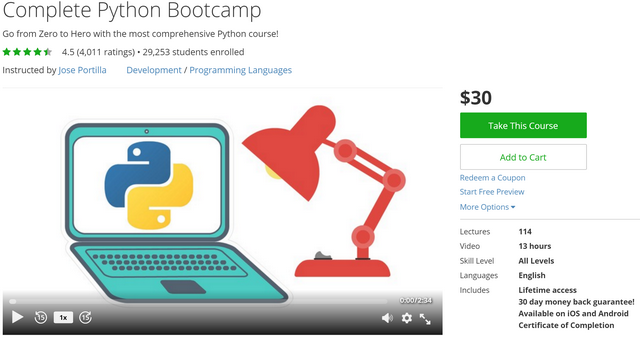 According to the instructor, going through this course will help you get the basics of Python under control and it’ll help you learn to code in Python 3. It also hits on some more advanced topics such as complex types, control flow, and Boolean type. Basically, the best way to look at this course is as one designed for someone who’s new to the specifics of Python, but not completely new to writing code 10 Tips for Writing Cleaner & Better Code 10 Tips for Writing Cleaner & Better Code Writing clean code looks easier than it actually is, but the benefits are worth it. Here's how you can start writing cleaner code today. Read More in general. This is the catch all course that’ll be perfect for everyone, regardless of skill level. It’s also quite a bit longer than the other ones, coming in with 114 lectures and 13 hours of content. The target audience for this course ranges from people who’ve never written a long of code in their life, to programmers who want to try out Python, and even intermediate Python coders who want to brush up and take their skills to a higher level. Not only is there plenty of video content to watch, but there’s also three major projects that’ll see you creating Python programs that can be used in a tutorial. There are screencasts of the code being written by the instructors and code notebooks for you to read. If you’re thinking about getting just one course, this is absolutely the one to grab. 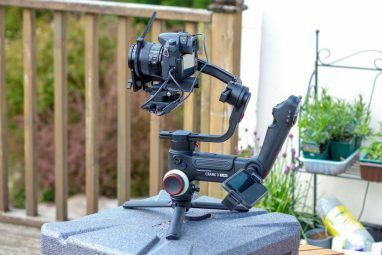 It’ll teach you a bit of everything, and quite honestly might be the most well-rounded online course I’ve ever come across (and I look at A LOT of courses). For $30, it’ offers solid value. Alright experienced Python programmers, I didn’t forget you. 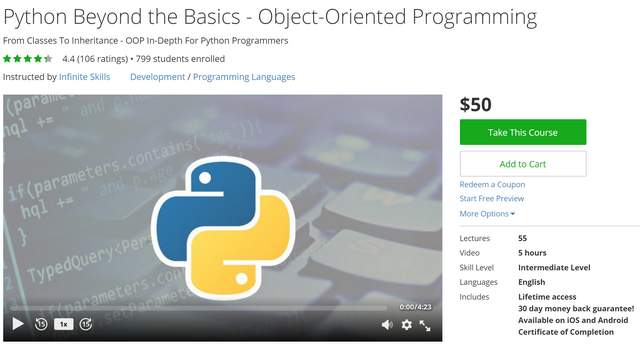 This highly-rated course is aimed at users with a working knowledge of writing code in Python. Because the concepts are a little more advanced and involved, the price tag is a bit higher at $50. However, if you’re already at the point where you need an intermediate to advanced course, and you know that you enjoy working with Python, then the investment should be easier to stomach. There’s a reason Python is constantly becoming more popular, and picking up the knowledge to use it yourself is definitely a smart move. The courses above cover topics for all skill levels on all budgets. What’s great is that since they’re from Udemy, you can try out a few lectures for free, and if you decide to buy one, you can get your money back within 30 days if you feel the content doesn’t deliver as promised. 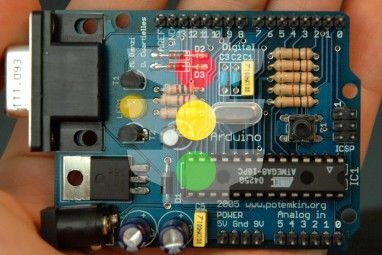 Explore more about: Education Technology, Programming, Python. 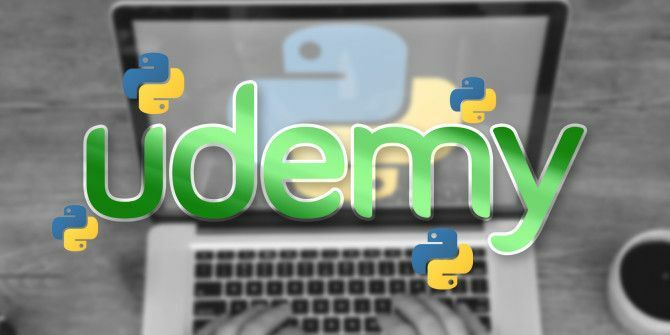 "Learn Python in 1 Hour" is no longer availabe at Udemy. I used PHP, Java, C# in my work. Could you tell me why need I learn Python ? While these sound interesting, they don't seem to be much different from a whole lot of other courses that have popped up over the years. What is sorely missing, imho, is an up-to-date tutorial on PyQt / Qt5. I've found very few which touch this area and (to my knowledge) they're all too old and/or are just throwing code at the user without explaining anything properly.